Click to download a PDF of this news release. Hawaiian Homes Commission Chairman Alapaki Nahale-a announced that the Hawaiian Home Lands Trust will be holding two meetings on Hawai’i Island this week to discuss a new homesteading opportunity with applicants on the island waitlist. To hear from the “top 100” applicants on the Hawai’i Island waitlist to gather mana’o from the beneficiaries to assess how the department can best address the needs of applicants longest on the waitlist. 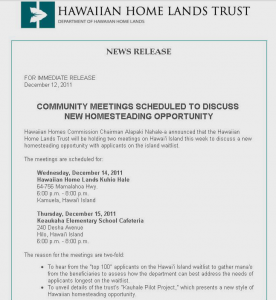 To unveil details of the trust’s “Kauhale Pilot Project,” which presents a new style of Hawaiian homesteading opportunity. Kauhale were traditional Hawaiian homesteads that consisted of multiple structures that served specific purposes — sleeping, eating cooking, etc. The modern adaptation of Kauhale will feature multiple residential units that incorporate common living areas to be shared among an extended family on a single homestead lot. The Hawaiian Home Lands Trust is looking to develop the pilot project on Hawai’i Island in Keaukaha in Hilo and/or Waimea to assist in assessing beneficiary demand for such multi-family residential homestead units. Multiple lessees will likely be connected to the Kauhale homestead. The goal is to move a family in to a Kauhale by the end of 2012. About 13 percent of applicant mailing addresses on record with the department are not current for various reasons and Chairman Nahale-a encouraged beneficiaries who have been on the Hawai’i Island waitlist for 40 years or more to please come to this week’s meeting. Beneficiaries are also encouraged to update their contact information (addresses, phone number and e-mail) with the department. The form to make changes can be found online at dhhl.hawaii.gov/applications/. Beneficiaries can also call, e-mail or visit Hale Kalaniana’ole or district offices to get necessary forms. The file is 543mb, 19 minutes long, raw video, MP4 format.